Dallisgrasslooks rather like a centipede when in bloom–except much more lovely. Each drooping raceme of resembles a segmented body, and the dark purple threadlike flowers that dangle beneath could look like the insect’s tiny feet. This showy grass was introduced from Brazil and Argentina, and is found growing throughout much of California–often in weedy places along roads and trails. The photos here were taken alongside the Bon Tempe reservoir. Though widespread throughout Marin, it isn’t considered an invasive. But it has naturalized throughout much of the US, and elsewhere it is considered a problematic weed. Dallisgrass (Papsalum dilatatum) looks a lot like its native cousin knotgrass, which is used as forage for cattle. 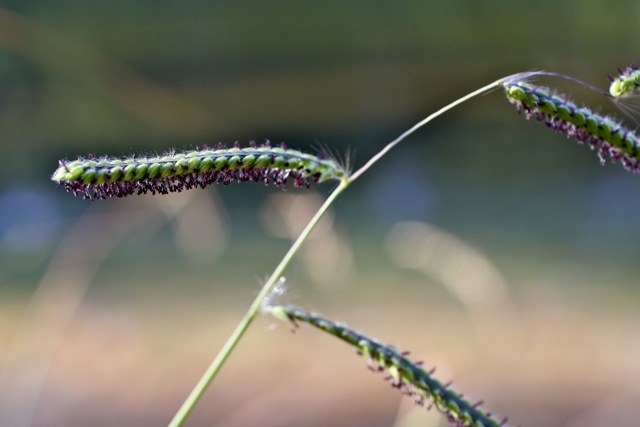 But dallisgrass is less palatable since it hosts a fungus that is toxic to livestock. Despite its attractive flowers, its habit of showing up as stiff clumps in lawns and golf courses also has made it unpopular. 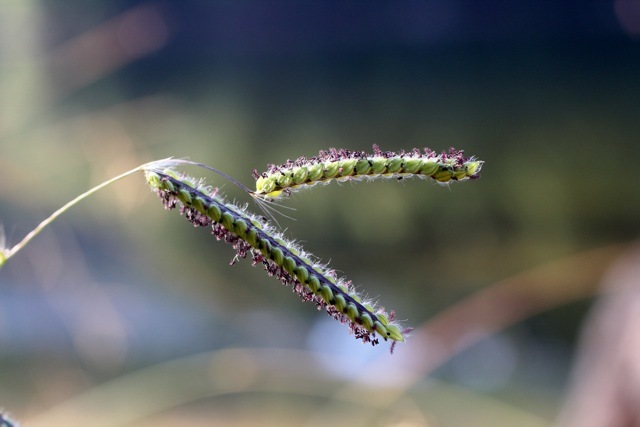 Look for 3-5 centipedes of flowers to distinguish dallisgrass from knotgrass (which generally only has 2 flowers per stalk).